Pillar to Post posting of June 21, 2015. RECALLING SLOPPY JOE’S SALOON—During my career as an erstwhile travel writer, I’ve always managed to wander in historic saloons that crossed my path. 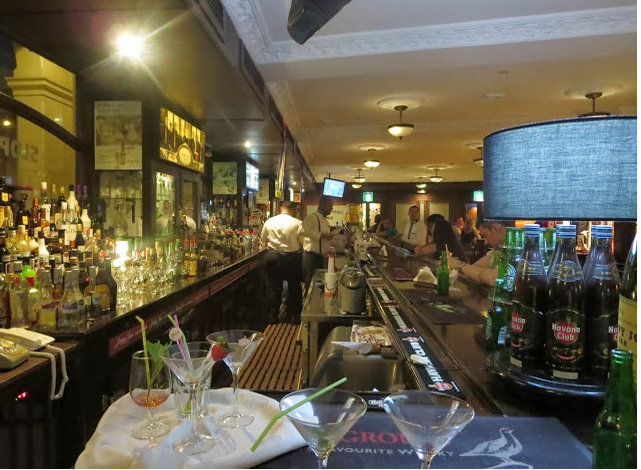 Places like Harry’s Bar in Paris and Venice; Perry’s in San Francisco; Raffles Hotel lobby bar in Singapore; P.J. Clarke’s in NYC and Harry Caray’s in Chicago to only name a few. My bucket list isn’t important because the bar has to find me. Here’s the latest one that found me. I was checking for a recipe for pot roast when my search stumbled upon a recipe for a Sloppy Joe sandwich. On the next Google search line was a link to Sloppy Joe’s legendary bar in the old town section of Havana, Cuba. Of course, I had to check the bar…thanks to the Internet. What I hope you just viewed was filmed by a cruise line aimed at the American tourists (probably made just before the Wall Street crash of Oct. 1929). The film is remarkable in that it isn’t staccato viewing. It shows folks walking around at normal pace as if it were filmed yesterday. The scene inside the unnamed restaurant is actually Sloppy Joe’s place. Ernest Hemingway visited the set of "Our Man in Havana,"
a 1959 film starring Alec Guinness (center) with Noel Coward. Sloppy Joe’s was popular with tourists, especially the film stars of the 1930s. Ernest Hemingway was there during the filming of the flick “Our Man in Havana.” Scenes from that movie were filmed in Sloppy Joe’s. WGN’s Julian Crews in Chicago says the famous watering hole is said to be the first to offer ground beef on a bun, beginning in the 1920's. 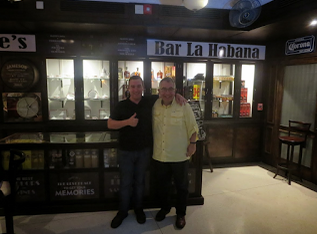 “If nothing else, the hearty offering helped rum-soaked patrons absorb buckets of Cuban Mojito's. Many believe the cooks served up a spicy, seasoned version of ground beef that's long been a favorite Cuban dish , known as Picadillo,” says Crews. Basically, the sandwich was named for Sloppy Joe’s place. Errol Flynn and Mr. Hemingway invented drinks at the bar on the corner of Zulueta and Animas Sts. 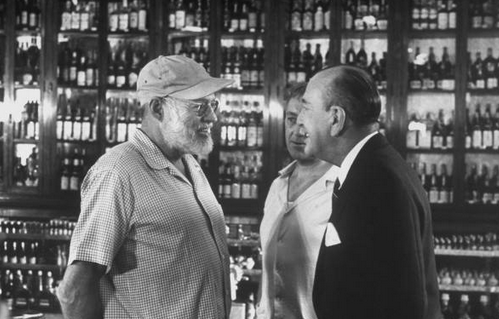 Actor Alec Guinness on set of "Our Man in Havana,"
spy comedy based on a Graham Greene novel. From a limited edition of “Sloppy Joe’s Bar Cocktails Manual,” we found a history of the white tablecloth restaurant (with famous bar attached). Sloppy Joe’s opened in Havana just as Prohibition banned bars in the U.S. With the help of Valentin Garcia, Jose Abeal (other histories call him Jose Garcia) bought a small grocery store and turned it into what would become Sloppy Joe’s. What’s a legendary bar without a legend? Story is an American tourist came up with the name by asking the waiter “…this place is certainly sloppy, look at the filthy water running from under the counter.” From then on, the name Sloppy Joe stuck. And, one hopes fixed the leak. 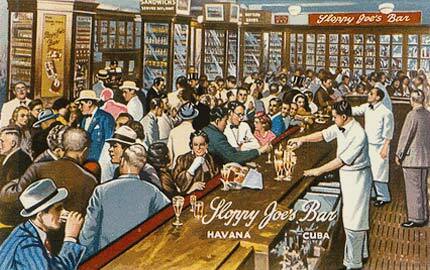 During the 20s, Havana was Sloppy Joe’s. Tourists headed straight from cruise ships to Joe’s, then right back. Joe himself had been turned into a legendary figure by the journalists who made his place their second home. Among the world's greats who dropped by for a sip were the Duke of Windsor, Jean-Paul Sartre, Errol Flynn, Gary Cooper, Clark Gable, Spencer Tracy, John Wayne, Frank Sinatra, and Greta Garbo. Sloppy Joe’s adopted Ernest Hemingway after he adopted Cuba, where the expatriate novelist lived for more than two decades. The Sloppy Joe’s served in American school cafeterias and diners came from imitation Sloppy Joe’s that popped up in the U.S. after the original Havana one opened. When Prohibition ended in 1933, a fellow by the name of Joe Russell opened a bar in Key West, Florida, called the Blind Pig, located in a rundown building that he leased for three dollars a week, selling 15-cent whiskeys and ten-cent shots of gin. After the addition of a dance floor, the name was changed to the Silver Slipper. 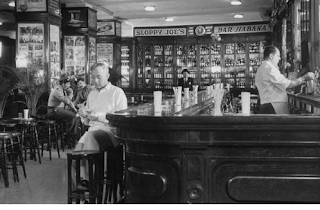 It was Hemingway with his connection to both Havana and Key West who suggested that Russell change the name of his bar, one of Papa’s favorite stateside watering holes, to Sloppy Joe's, borrowing on the fame of the Cuban original. 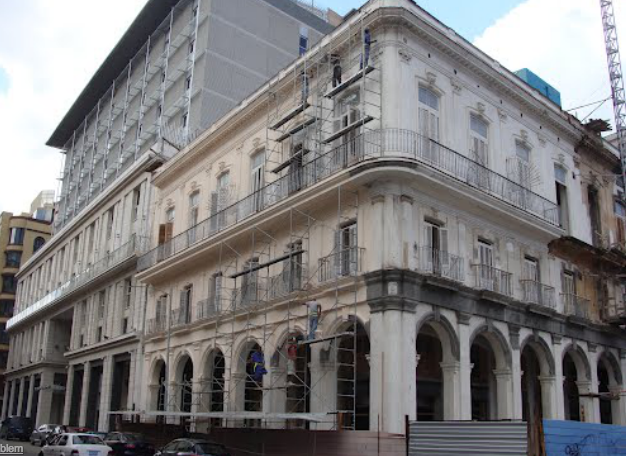 It was shut down in 1959 after the success of the Cuban revolution. And, version two that a fire destroyed it in 1960 and it was never rebuilt. Have you noticed absolutist regimes have precious little sense of humor or saloon history? 2011 image of the building that once housed Sloppy Joe's. Anyway, there is word that the Cubans are almost finished rehabbing the old Sloppy Joe’s building into a new Sloppy Joe with a hotel upstairs. It should be open soon. Or maybe not. Anyone traveling there that has images of the new Sloppy Joe’s in Havana get in touch with me at San Diego Home/Garden Lifestyles magazine and I’ll update this post. 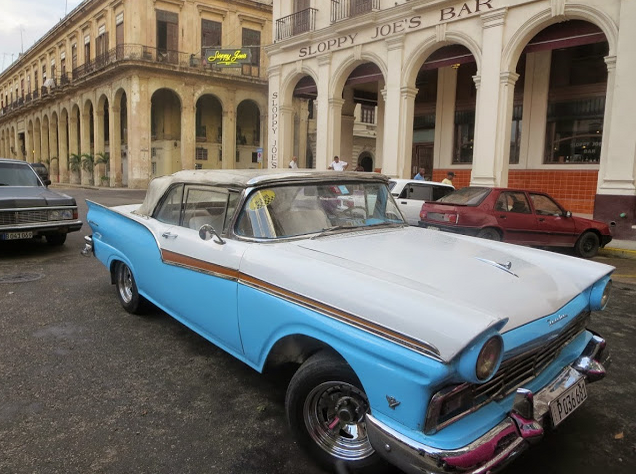 BUCKET LIST UPDATE: Thanks to a Gate One Travel junket in late April, 2015, my wife, Phyllis and son, Michael went to Cuba for an amazing 9 days. During the trip, while Phyllis explored the shops, Mike and I went to Sloppy Joe's via a 1950s Ford convertible with a Russian engine. Alas, it rained so we arrived with the top down. But as dear old dad used to say it doesn't rain inside a good pub. We had sandwiches and drinks inside Sloppy Joe's. Lucky man to be able to be there with a son. Hi, you may have updated this post already but in case you haven't: the newley renovated Sloppy Joes has opened in Havana. The same long bar is there and mostly the same atmosphere of the 50's. If you look it up in google you will find recent photos. I hear the only thing not present is the floor to ceiling mahogany cabinets.